We’re on top of Mt. Karthala – an active volcano dominating the largest island in the Comoros archipelago – filming Unknown Africa for the BBC. 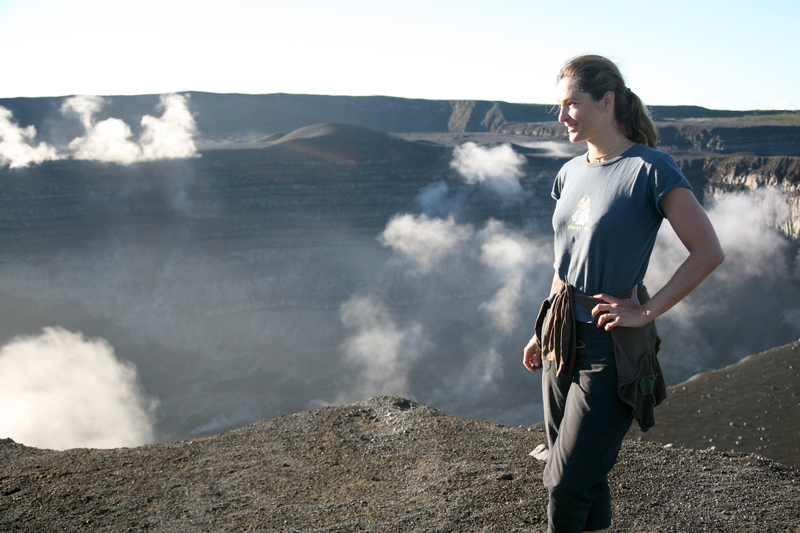 It’s a long hike to get to the top but once you’re at the summit a sensational view spreads out across the islands and into the volatile depths of what is the largest live caldera in Africa. We spent the night huddled close to the rim up in the crater, supposedly shielded from the wind and plummeting temperatures, but it was still bitingly cold and we didn’t sleep a wink. Early next morning an explosion shook the ground beneath us and the crater floor was filled with snakes of cooling lava. I’ve come here to find out what animals live on these little known tropical islands – strung halfway between the African continent and the island of Madagascar – like a necklace of jewels gracing the throat of the Mozambique channel. 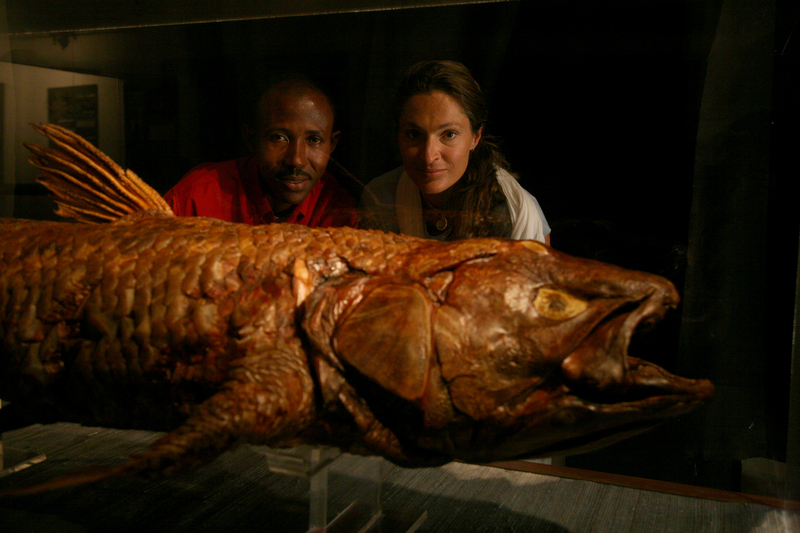 The most famous of creatures found in the Comoros is the coelacanth, presumed to have gone extinct 70 million years ago. In 1938 a most peculiar specimen caught off the coast of Mozambique was picked out of a fish pile by a budding museum curator, Marjorie Latimer. In great excitement she sent it off to be identified by a famous ichthyologist, J.L.B. Smith, whose “remarkable feat of mental agility” recognized it as a modern coelacanth. This extraordinary living fossil makes its home in the Comoros islands 200m below the surface, and being sensitive to light and pressure sleeps by day at depth in black volcanic caves. One of the great delights of the Comoros are the people. Despite the islands being described as “trés tendus” (very tense), I spent wonderful time with a group of women who taught me how to use a paste of coral and sandalwood as a face mask to protect skin from the sun. It was deliciously cool and felt wonderful. Although the islands are geologically quite new, they’ve been colonised by a fair variety of different animal species, one of which comes to nest on the beaches. Green turtles spend most of their lives at sea, but return to the shores of Moheli, the smallest of the Comoros islands, in spectacular numbers. At night, with a silvery lit ocean and arcing star-scape, turtles drag themselves above the high tide mark to dig deep nests and lay 100 – 200 eggs each. Hearing the sound of scores of turtles on the beach exhaling in rasping bursts as if they were still in the ocean was magical. I loved being surrounded by these ancient creatures, knowing of the thousands of aching kilometers they’d swum to return to the very same beach on which they were born. Our interest in a local conservation NGO, Action Comoros, and the pterodactyl-like Livingstone’s flying fox (fruit bats) that live in the highest parts of the montane forest, intrigued local media enough to invite us onto a live TV chat show on Anjouan. They loved our close up footage of the bats and broadcast a half hour special. Led by Mr. Mutui, Action Comoros are doing sterling work to protect the remaining pockets of primary forest, the last montane refuge where the bats can roost. Deforestation on the island has led to the loss of most of its rivers, serious erosion, sedimentation of coral reefs, and loss of biodiversity. Action Comoros explain that the Livingstone bat is a flagship species whose fate reflects the eventual fate of the islands and the inhabitants. The end of each day in the Comoros is a gentle wildlife spectacle. As the sun sets across the sea, Comorian fruit bats dip their chests into the surface of the waves to lick saltwater from their fur. It’s a daily ritual as integral to the island as the Islamic call to prayer.